GCPE explorers, left to right: George, Jan (partially hidden), and Sydney. We may don pith helmets and go to great lengths to rendevous in space and time for our adventures, seeking the powerful and unusual energies of Main Coordination Points, but it is truly the "unknown" reality -- an inner landscape -- we seek to explore, a realm entirely beyond the usual constraints of physical reality. Main Coordination Points, mysterious structural elements of physical reality creation emanating from inner space, serve as significant symbols for our questing souls. Humanity has thoroughly mapped and explored much of the earth and now lusts to pursue the mysteries of outer space -- but the inner realm is far vaster, far richer, and explorations into it have barely begun. Conceptually, coordination points are loosely affiliated with ley lines and powerpoints -- natural landscape features detectable by dowsing or similar activities. Such features remain outside the realm of contemporary science (despite certain theoretically measurable effects -- extremely minute fluctuations of physical "laws" at the heart of coordination points) as their most immediately noticeable effects are of a subjective nature; sensitivity to them varies from one observer to another. They will not be considered "objective" until or unless their fields are measured with exceedingly sensitive instruments. Seth speaks of three categories of coordination or coordinate points: Subordinate, Main, and Absolute. Seth says our space "is filled with" subordinate points, adding that "these are important in allowing you to transform thoughts and emotions into physical matter. When a thought or emotion attains a certain intensity, it automatically attracts the power of one of these subordinate points, and is therefore highly charged, and in one way magnified, though not in size." Seth describes Main Coordination Points as being "pure mathematically, sources of fantastic energy." He adds: "There are four absolute coordinate points that intersect all realities. These coordinate points also act as channels through which energy flows, and as warps or invisible paths from one reality to another. They also act as transformers, and provide much of the generating energy that makes creation continuous in your terms." "These points impinge upon what you call time, as well as space. There are certain points in time and space, therefore, (again in your terms), that are more conducive than others, where both ideas and matter will be more highly charged. Practically speaking, this means that buildings will last longer; in your context, that ideas wedded to form will be relatively eternal. The pyramids, for example, are a case in point." "These coordinate points -- absolute, main, or subordinate -- represent accumulations or traces of pure energy, minute to an extreme if you are thinking in terms of size -- smaller than any particle of which your scientists know for example, but composed of pure energy. And yet this energy must be activated. It is dormant until then -- and it cannot be activated physically." Seth provides the general locations for several Main Coordination Points in Seth Speaks (including Jerusalem, Chicago, Minneapolis, Utah, and several other locations) but leaves it to his readers to discover precise locations and the great many Main CPs not mentioned. The Great Coordination Point Expedition might have remained nothing but an Internet flight of fancy; instead, events took an unexpected turn. A group of subscribers to the mailing list in question met in person for the first time, in coastal Massachusetts. Soon, an antique ouijaboard came out, complete with two adept users of this archaic non-electronic technology. "New York City -- Manhattan. The parameters are over an acre in dimension, centering on Central Park." Visiting the Giza plateau, Jerusalem, or even Chicago or Utah would require long journeys, but New York City was only 200 miles away, and easy to get to. There was no excuse for not inspecting Central Park at firsthand. Before long, what had begun as a somewhat silly discussion thread on a mailing list was transformed into a genuine physical expedition. 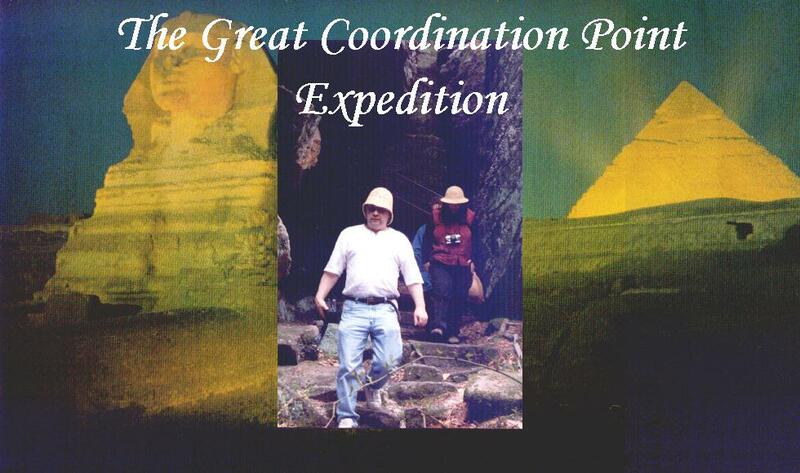 The Great Coordination Point Expedition met on May 10, 1997, to experience a Main Coordination Point for the very first time.